Title The / Holy Bible, / Translated from / The Latin Vulgate; / Diligently Compared with the / Hebrew, Greek, and Other Editions, in Divers Languages. / The / Old Testament, / First Published by the English College, at Douay, A. D. 1609; / and the / New Testament, / First Published / by the English College at Rhemes, A. D. 1582. / with Annotations, / References, and an Historical and Chronological Index. / The Whole Revised and Diligently Compared with the / Latin Vulgate. / Published with the Approbation of / The Right Rev. Dr. Denvir. / Belfast: / Printed and Published by Robert & Daniel Read, / Crown-Entry, High-Street. / 1847. Title The / Holy Bible, / Translated from / The Latin Vulgate; / Diligently Compared with the / Hebrew, Greek, and Other Editions, in Divers Languages. 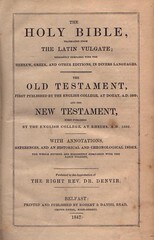 / The / Old Testament, / First Published by the English College, at Douay, A. D. 1609; / and the / New Testament, / First Published / by the English College at Rhemes, A. D. 1582. / with Annotations, / References, and an Historical and Chronological Index. / The Whole Revised and Diligently Compared with the / Latin Vulgate. / Published with the Approbation of / The Right Rev. Dr. Denvir. / Belfast: / Printed and Published by Robert & Daniel Read, / Crown-Entry, High-Street. / 1852. Publisher Robert & Daniel Read, Belfast. Title The / Holy Bible, / Translated from / The Latin Vulgate; / Diligently Compared with the / Hebrew, Greek, and Other Editions, in Divers Languages. / The / Old Testament, / First Published by the English College, at Douay, A. D. 1609; / and the / New Testament, / First Published / by the English College at Rhemes, A. D. 1582. / with Annotations, / References, and an Historical and Chronological Index. / The Whole Revised and Diligently Compared with the / Latin Vulgate. / Published with the Approbation of / The Right Rev. Dr. Denvir. / Belfast: / Printed and Published by Robert & Daniel Read, / Crown-Entry, High-Street. / 1856. Title The / Holy Bible, / Translated from / The Latin Vulgate; / Diligently Compared with the / Hebrew, Greek, and Other Editions, in Divers Languages. / The / Old Testament, / First Published by the English College, at Douay, A. D. 1609; / and the / New Testament, / First Published / by the English College at Rhemes, A. D. 1582. / with Annotations, / References, and an Historical and Chronological Index. / The Whole Revised and Diligently Compared with / the Latin Vulgate. / Published with the Approbation of / The Right Rev. Dr. Denvir. / Belfast: / Printed and Published by Robert & Daniel Read, / Crown-Entry, High-Street. / 1858. Title The / Holy Bible, / Translated from / The Latin Vulgate; / Diligently Compared with the / Hebrew, Greek, and Other Editions, in Divers Languages. / The / Old Testament, / First Published by the English College at Douay, A. D. 1609; / and the / New Testament, / First Published / by the English College at Rhemes, A. D. 1582. / with Annotations, / References, and an Historical and Chronological Index. / The Whole Revised and Diligently Compared / with the Latin Vulgate. / Published with the Approbation of / The Right Rev. Dr. Denvir, / Late Bishop of Down and Connor. / Dublin: / M.H. Gill & Son, 50, Upper Sackville-Street. / 1879. Comments Edition by a new publisher. Title The / Holy Bible, / Translated from / The Latin Vulgate; / Diligently Compared with the / Hebrew, Greek, and Other Editions, in Divers Languages. / The / Old Testament, / First Published by the English College at Douay, A. D. 1609; / and the / New Testament, / First Published / by the English College at Rhemes, A. D. 1582. / with Annotations, / References, and an Historical and Chronological Index. / The Whole Revised and Diligently Compared / with the Latin Vulgate. / Published with the Approbation of / The Right Rev. Dr. Denvir, / Late Bishop of Down and Connor. / Dublin: / M.H. Gill & Son, 50, Upper Sackville-Street. / 1885. Date None; NT title dated 1891. Comments One of many American reprints of this edition (see following). Title The / Holy Bible, / Translated from / the Latin Vulgate; / Diligently Compared with the / Hebrew, Greek, and Other Editions in Divers Languages. 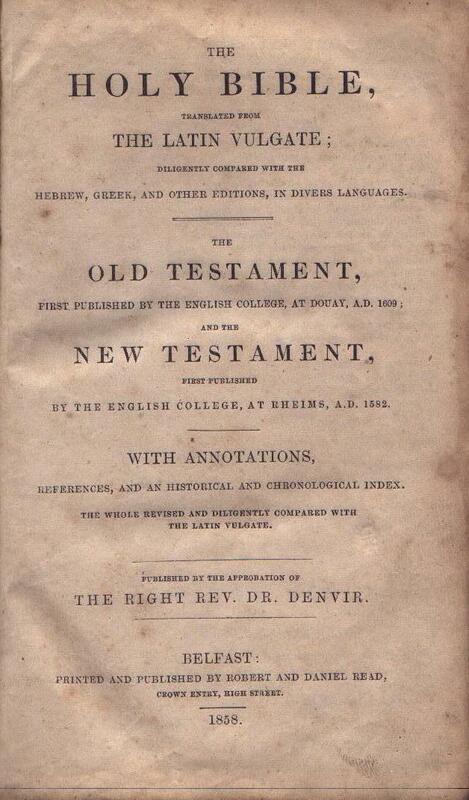 / The / Old Testament, / First Published by the English College at Douay, A. D. 1609 / and the / New Testament, / First Published / by the English College at Rhemes, A. D. 1582 / with Annotations / References, and an Historical and Chronological Index. / The Whole Revised and Diligently Compared / with the Latin Vulgate. / Published with the Approbation of / The Most Rev. Dr. Denvir / Late Bishop of Down and Connor / New York, Cincinnati, and Chicago. / Benziger Brothers, / Printers to the Holy Apostolic See. / Dublin: M. H. Gill and Son.